Active Sensing: A MIDI message that carries no note data or control instructions but simply indicates to a receiving device that the MIDI line is in working order. additive synthesis: A method of sound creation derived by combining (adding) a series of waveforms. ADSR: Abbreviation for "Attack, Decay, Sustain, Release"; the four stages of a standard envelope generator. See Envelope Generator. AES/EBU digital standard: Digital audio standard developed jointly by the Audio Engineering Society (AES) and the European Broadcast Union (EBU). The standard describes a format for transmitting two channels of digital audio along a serial cable. See S/PDIF. AES: The Audio Engineering Society, a professional association of sound engineers headquartered in New York City, with chapters throughout the world. Sponsors large annual conventions showcasing new audio technologies and products. AFM: Abbreviation for Audio Frequency Modulation, the processing scheme used for recording high-quality audio in videocassette recorders equipped with "Hi-fi" stereo audio. Aftertouch/Pressure: MIDI continuous control message derived from the amount of pressure applied to a controller key, or keys, after they have been depressed. There are two variations: Channel and Polyphonic. With Channel Aftertouch, all keys trigger a common stream of aftertouch values that affect the entire keyboard. With Poly Aftertouch, each key sends its own stream of aftertouch values. algorithm: A set of instructions used to solve a particular problem in a finite number of steps. For example, in electronic music, an algorithm can provide the instructions for altering a signal in an effects processor or changing parameters in a synth patch. In algorithmic composition, algorithms determine specific permutations of music (usually MIDI) data performed by music-composition software. aliasing: Noise in the form of undesirable signal components that can occur during the analog-to-digital conversion process. Occurs when the sampling frequency of a digital system is less than twice the highest frequency of the signal being recorded. The effect of aliasing is substantially reduced by using oversampling, "brickwall" anti-aliasing filters that block signals above a particular frequency, and various noise-shaping techniques. See Nyquist theorem. All Notes Off: A MIDI message that turns off any notes sounding at a particular time. This is useful for stopping "stuck" synth notes and can also be inserted as a command in a MIDI sequence to make sure that all notes are in the "off" position before issuing new commands. According to the MIDI 1.0 Detailed Specification, All Notes Off support is a recommended practice but is not required; hence, some instruments do not recognize this message. See Panic Button. amplifier: A device that tracks the amplitude of an incoming signal and proportionally increases the voltage, current, or power of the signal by adding power from another source. amplitude: The magnitude, or level, of an electrical signal (voltage) or acoustical signal (volume). amplitude modulation: A method of altering a signal by changing (modulating) the level (amplitude) of the signal. In its simplest form, this could involve creating a tremolo effect by quickly turning a volume control up and down while listening to a sound. With analog synthesizers, a waveform's amplitude can be electronically modulated to create sum and difference frequencies, thus altering the waveform. Abbreviated "AM." analog: In recording, a signal that is stored as a continuously varying electrical representation (analog) of the input signal. analog synthesis: uses electronic oscillators, filters, and envelopes to directly create and manipulate electrical currents that are "analogous" to the sound waveforms they represent. 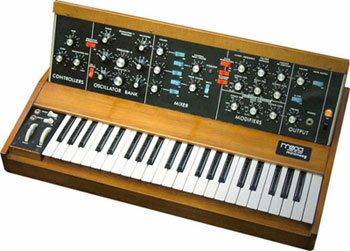 One of the first successful commercial analog synthesizers, Moog Music's Minimoog still retains a loyal following. analog-to-digital converter (ADC): A circuit or hardware peripheral that converts audio signals from the analog domain into a digital form. attack: The first part of a sound, defined as the amount of time it takes for the signal to rise from silence to its greatest amplitude. This initial period of attack is typically followed by a gradual decay of the sound. attenuation: The process of decreasing the amplitude of a signal as it passes from one point to another. Analog attenuation circuits typically use resistors to reduce the voltage of a signal. In audio, the effect of such attenuators is usually expressed in decibels. See decibel, resistor. aux send: Slang for auxiliary send, a circuit pathway in a mixing console that supplies an independent mix, which can be routed to an external (auxiliary) device such as an effects processor or monitor system. Most modern consoles have several aux sends on each input so several devices can process a sound. See bus. balanced line: An audio line consisting of three conductors: two carrying signal and a ground (shield) wire, where one of the signal wires carries the sound, while the other carries an inverted copy. When the signal reaches the destination, the inverted copy is flipped and added to the original. Any noise that has been induced into the signal also is inverted. When this is combined with the "uninverted" noise, it cancels it out. Balanced lines thus are less susceptible to hum and can carry audio signals over longer distances. Balanced audio lines typically use 3-pin XLR, or 1/4-inch tip-ring-sleeve, phone connectors. band-reject filter: The opposite of a bandpass filter; a device that passes all signals except those in a specified frequency range. bandpass filter: A circuit that allows signals at frequencies within a specified range (band) to pass through unaffected, while the level of signals at other frequencies is reduced. baud rate: The speed at which digital information is transmitted, in bits per second. MIDI's baud rate is 31.25 kilobaud, or 31,250 bits per second. Named after Jean Maurice Emile Baudot, the inventor of the first teletype code. biamp: Short for "biamplification." A 2-way audio system in which the signal is divided by frequency into two signals that are independently amplified and fed to separate speaker-system components (e.g., woofers and tweeters). In a "triamped" system, signals are divided by frequency into three individually amplified groups. See crossover. bit: Short for binary digit, this is a single piece of information (expressed as either 0 or 1) in a computer or digital system. boot: The process of starting up a computer or other digital device, during which it loads its initial instructions. A cold boot occurs when a computer is started after having the power turned off. A warm boot occurs when the computer is restarted without powering down the system. bounce: In multitrack recording, the process of recording several tracks and mixing these sounds down to one or two unused tracks. For example, on an 8-track recorder, you could record six tracks, "bounce" them down to two available tracks, and then record over the original six tracks. bpm: An abbreviation of "beats per minute," a standard method of indicating musical tempo. bridged mono: A method of combining both channels of certain stereo power amplifiers to create a doubly powerful single-channel (monaural) amp. See monaural. buffer: In computer use, a place where data can be stored temporarily. bug: A flaw in hardware, software, or firmware. bus: An internal pathway for data or audio signals in a computer or audio device. Frequently misspelled "buss." byte: A piece of digital information. Much like each word is a piece of an English sentence, a series of bytes typically makes up a digital message. In MIDI, bytes usually are made up of eight "bits," and most messages are two or three bytes in length. What's half of a byte? A nibble, of course. capacitor: An electrical component with the ability to store an applied electrical charge. cardioid microphone: A microphone with a directional pickup pattern that is most sensitive to sounds coming from the front and sides, while rejecting sounds coming from the rear. 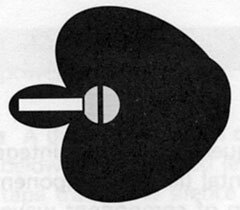 The pickup pattern is roughly heart-shaped when viewed from above, hence the name "cardioid." The cardioid microphone is popular in live sound applications. With its characteristic heart-shaped pickup pattern, it offers a high degree of feedback rejection. carrier: A waveform that is constant in amplitude or frequency and can be modulated by another waveform. In radio broadcasting, a carrier wave can be amplitude-modulated (AM) or frequency-modulated (FM) by the audio signal to be transmitted. See FM synthesis. CD-I: Compact Disc-Interactive. A multimedia compact disc format that allows users to interact with computer programs incorporating digitized audio, video, graphics, and text. CD-R: Compact Disc-Recordable. Format for a user-recordable compact disc. The recorded disc can be played in any CD player. CD-ROM: Compact Disc-Read Only Memory. A compact disc format for storing and delivering computer applications and digitized audio, video, graphics, and text. cent: One-hundredth of a semitone. chorusing: Audio processing that uses a series of short, continuously varying delays that produce slight pitch-shifts and add fullness to a sound. The effect emulates the way a vocal chorus singing in unison sounds thicker than a solo voice. click track: An audio track, consisting of short tones, that acts as a metronome, helping musicians play at a preselected tempo. May be recorded on tape, or on a MIDI sequencer. clipping: A distortion condition in which the top of a waveform is cut off ("clipped"). Usually caused when a signal overloads a stage of the device being driven. clock: A source of timing information, especially important when two or more devices must be synchronized. See synchronization. compander: A system that compresses a signal at one end of an audio chain and later expands it, thus restoring the dynamic range of the original signal. Often used in wireless microphone systems as a means of overcoming the dynamic range restrictions of radio transmission systems. Also used as a form of noise reduction: The compressor restricts the dynamic range, attenuating low-level noise. The compressed signal is amplified and expanded to restore its original dynamic range, without the noise. 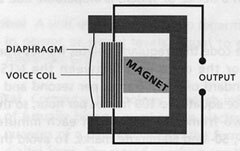 compression driver: A specialized mid- or high-frequency speaker consisting of a small diaphragm and voice coil coupled to a large magnet structure. The unit is mounted to a horn, which acoustically matches the impedance of the driver to the impedance of the air and shapes the signal. Compression drivers tend to be expensive due to the precision tolerances required in their manufacture, but they deliver many times more sound pressure per watt of input power than traditional direct-radiating cone speakers. compressor: A device that smoothes the level of an input signal by regulating its dynamic range. A compressor prevents the signal from rapidly exceeding or falling below a selected amplitude threshold. Beyond the threshold, the ratio of the signal's input level to output level (e.g., 2:1, 4:1, and so on) can be user-selected. Compression commonly is used to keep mic levels within an acceptable range. Because it can slow a signal's rate of decay below the threshold, compressors also are used to add sustain to instruments such as electric guitar and bass. eleThe dbx 166XL dynamics processor includes a compressor, limiter, gate, and expander. condenser microphone: A microphone that picks up sounds via an electrically charged, metallized diaphragm, which is separated from a conductive back plate by a thin air layer. Sound waves striking the diaphragm cause a minuscule voltage change, which is increased by a tiny amplifier circuit within the mic body. Since power is required by both the microphone capsule and the amplifier, condenser microphones must have a power source, which can be a battery inside the mic body or "phantom" power from a mixing console or external power supply. See phantom power. A cutaway view of a typical condenser microphone reveals its three key elements: the electrically charged front diaphragm, backplate, and amplifier circuit. Continuous Controllers: A set of MIDI messages, such as Modulation Wheel and Volume, that represent dynamic or continuously changing aspects of a performance. These are the primary means of communicating musical expressiveness with MIDI. control voltage: Electrical signal used to control the values of components (e.g., amplifiers, filters, and oscillators) in analog circuits. CPU: Abbreviation for Central Processing Unit, the "brain" chip in a computer, synthesizer, or other digital device. Also refers to the main hardware box containing the CPU chip in a computer. crossover: A dividing network that splits a full-range signal into two or more frequency groups and routes them to feed the various components (e.g., woofers and tweeters) in a speaker system. Passive crossovers usually are built inside speaker cabinets, where they divide an amplifier's output signal for routing to different speaker combinations. Active crossovers divide a line-level output signal from a mixer or other sound source and route the resulting signals to individual amplifiers that drive different speaker components. See biamp. cue: A section of music used in a film or video. A cue can range from a short piece of background music to a complex score. The specific parts of the music that correlate to visual events are referred to as "cue points" or "hit points." cutoff frequency: The frequency point above or below which a filter strongly attenuates a signal. (Usually, the signal's output level at the cutoff frequency is 3 dB below its input level.) In a lowpass filter, a high cutoff frequency allows most of a sound through and generally produces a bright sound, while a low cutoff frequency blocks most of the sound and produces a muted or plain sound. See highpass filter, lowpass filter. D-RAM: Abbreviation for "Dynamic Random Access Memory," a volatile form of computer memory that holds its data only as long as a device is turned on (applying an electrical charge). See RAM. DAT: Abbreviation for Digital Audio Tape. A digital tape-recording format using a small cassette that provides up to two hours of 16-bit, linear, PCM digital recording at a sampling rate of 32, 44.1, or 48 kHz. As the current DAT standard specifies a transport using rotary heads (similar to a video recorder), the format originally was referred to as R-DAT, but the "R" designation is seldom used. See pulse-code modulation. DAW: Abbreviation for Digital Audio Workstation, a generic name for an integrated system that records, edits, and manipulates audio in the digital domain. dB: Abbreviation for "decibel." See decibel. dBm: A term expressing an electrical power level, referenced to 1 milliwatt (i.e., 0 dBm = 1 mW). Originally dBm was used to express the power dissipated in telephone applications with 600-ohm impedances, but it is not necessarily referenced to a particular impedance. dBu: A means of expressing voltage, referenced so that 0 dBu equals 0.775 volts, regardless of impedance. One mW of power is dissipated if 0.775 volts is applied to a 600-ohm load, so when the load impedance is 600 ohms, 0 dBu = 0 dBm. dBV: A means of expressing voltage, referenced so that 0 dBV equals 1 volt RMS, regardless of impedance. dBv: Synonymous with dBu but rarely used due to confusion with dBV. See dBu. DCA: Abbreviation for "Digitally Controlled Amplifier," an amplifier circuit whose output gain can be varied by a digital signal. DCC: Abbreviation for "Digital Compact Cassette," a format developed by Philips that uses PASC (Precision Adaptive Subband Coding) data compression to record digital audio on 1/8-inch wide magnetic tape at 1 7/8 inches per second. DCC hardware is designed with the ability to play both DCC and standard analog cassettes. DCO: Abbreviation for "Digitally Controlled Oscillator," an oscillator circuit whose output frequency can be varied by a digital signal. decay: The gradual diminishing of a sound after the original occurrence (attack) of the signal. See ADSR. decibel: A unit of measure used to logarithmically express ratios of change in power or signal levels. Equal to one-tenth of a Bel (named for Alexander Graham Bell). digital: Computer technology in which information is described as a series of (usually binary) numbers. In electronic music, audio signals, or the nuances of a performance (in the form of MIDI data), can be stored in digital form. The stored numbers can be translated back into sound, or can reproduce the performance on electronic instruments. digital-to-analog converter (DAC): A device that converts audio from the numeric string of a digital representation to an analog signal of constantly fluctuating voltages. digitally controlled amplifier: See DCA. digitally controlled oscillator: See DCO. DIN: Abbreviation for the Deutsche Institut fur Normung, a German standards organization that proposed a set of standard connector configurations in the early 1960s. The standard MIDI connector is the 5-pin DIN. Typical DIN connector used for a MIDI Out port. There is no connection to pins 1 and 3; pin 4 carries +5 volts and pin 5 carries the MIDI datastream. Pin 2 is ground. diode: An electrical component that passes current in one direction only. DIP switch: Abbreviation for Dual In-line Package, this is one or a series of compact switches designed for mounting directly on a circuit board. DIP switches are often found inside computers and other electronic gear as a method of setting user preferences and defaults, usually in "set-and-forget" applications. Direct Time Lock (DTL): An early MIDI synchronization system developed by software manufacturer Mark of the Unicorn. downtime: A period of time when a device or system is inoperable due to malfunctions. drop frame: A type of SMPTE time code that regularly deletes frames from its display to compensate for the difference between the NTSC (American) color television standard of 29.97 frames per second and a real-time counter. The difference equates to 108 frames per hour, so the drop-frame standard skips two frames at the end of each minute, except for the 10-, 20-, 30-, 40-, 50- and 60- minute marks. To avoid this confusion, most audio-only applications (synchronizing two multitrack transports, etc.) specify non-drop time code. DSP: Abbreviation for "digital signal processing." duty cycle: The amount of time a device can be used, as compared to its requiredperiod of idle or "rest" time. A duty cycle generally refers to a piece of equipment rated for intermittent--rather than continuous--operation. 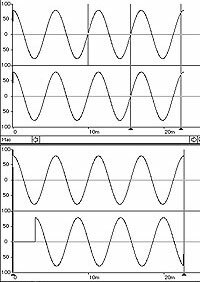 In a waveform, the duty cycle is the ratio of the positive period to a full cycle; thus, a square wave is a pulse wave with a 50% duty cycle (half positive-going and half negative-going). See pulse wave. dynamic allocation: A feature of multitimbral synthesizers where a voice always is made available to sound new notes when all the synth's polyphonic voices are in use. In the most common scheme, the most recently played note "steals" the voice from the oldest note, which ceases to sound. For example, let's assume you're playing a fat pad sound in the left hand and piano in the right, and your synth can play only eight notes at once. If you sustain a 4-note chord in the pad sound, then play a 5-note, sustained chord on piano, synths with dynamic allocation will silence the first note you played in the pad to complete the piano chord. The usual alternative to dynamic allocation is to assign an inflexible, predetermined number of voices per sound. dynamic microphone: A transducer that relies on the law of induction, with an output proportional to the velocity of a moving element within a magnetic field. The most common type is the moving-coil microphone, which picks up sounds when sound waves strike a diaphragm attached to a coil of wire. 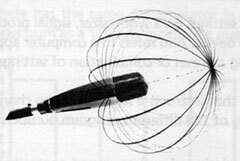 When the coil moves within the magnetic structure of the microphone, it creates an output voltage. The process is exactly the reverse of the way a speaker operates. Moving-coil dynamic microphones tend to be extremely rugged, making them well-suited for most sound-reinforcement applications. The other common type of dynamic microphone is the ribbon mic. See ribbon microphone. Cutaway view of typical moving-coil dynamic microphone. Sound waves striking the front diaphragm move the voice coil up and down within a magnetic structure, creating a tiny voltage that is analogous to the acoustic signal. dynamic range: A ratio (expressed in decibels) of the difference between the softest and the loudest sound that can be produced, reproduced, or captured by a musical instrument or audio device. echo: The effect of a sound reflecting off a distant surface and returning to the source. Typically, an echo is defined as a delay lasting over 50 milliseconds (.05 seconds). editor/librarian: A computer program designed for creating, modifying, manipulating, and storing settings for MIDI-based devices, such as synthesizers and signal processors. electric musical instrument: A musical device that uses an electricalmeans of reproducing sounds it creates via acoustical or mechanical actions. Examples include the electric guitar and the Fender Rhodes electric piano, which uses pickups to capture the vibrations of struck metal tines. electronic musical instrument: A musical device that uses electroniccircuits to create sounds. Examples include synthesizers and samplers. envelope: The contour of a waveform, showing changes in amplitude, pitch, or timbral characteristics over time. A basic envelope usually has four stages: attack, decay, sustain, and release. See ADSR. envelope generator: An electronic circuit or software construct capable of creating a contoured signal that changes parameters over time. A sound's volume envelope determines the different volume levels of a sound from the point it is first played until it is no longer heard. A filter envelope similarly determines the changing spectral content of a sound over time. See ADSR. EOX: An abbreviation for "End of Exclusive," a System CommonMIDI message used as a flag in a MIDI datastream to indicate the end of a System Exclusive message transmission. EPROM: Acronym for "Erasable Programmable Read Only Memory," a type of memory chip that can be erased and reloaded with new information or instructions. Standard EPROMs are erased by exposure to ultra-violet light, so the top surfaces of encoded EPROMS are usually covered by a small sticker to prevent accidental erasure. EEPROM (Electrically Erasable Programmable Read Only Memory) is a type of EPROM that can be erased by an electrical voltage, making the chips much easier to update. equalization: A circuit that allows the frequency-selective manipulation of a signal's amplitude. The simplest equalizers are shelving types, offering the ability to cut or boost gain above or below a given frequency. Examples include the treble and bass controls found in home stereo systems or guitar amps. More complex circuits that allow tonal shaping in multiple frequency bands include graphic and parametric equalizers. Abbreviated "EQ." See graphic equalizer, parametric equalizer. expander: A device that provides a gradual attenuation of signals that fall below a user-defined threshold (such as a gate circuit). This process, known as expansion, reduces background noise and at the same time increases the dynamic range of the input signal. feedback: A condition where the output of a circuit recycles through its input. Acoustic feedback is a whine or howl that occurs in live audio situations when an amplified sound reenters a sound system through the same microphone (or guitar pickup) that reproduced the original source, creating a loop. Feedback also can be used in signal processing; for example, part of a signal routed through a digital delay can be fed back into the delay to create a more complex effect. This also is called "regeneration." filter: A device that attenuates or removes certain elements or data from an audio waveform or datastream. A MIDI data filter removes certain messages (Pitch Bend, Program Change, Active Sensing, etc.) from the MIDI datastream. See bandpass filter, band-reject filter, highpass filter, lowpass filter. flanging: An effect created by splitting an audio signal into two identical signals; applying a constantly varying, short delay (usually 2 to 15 milliseconds) to one signal; and mixing it with the unaltered signal. This results in a swept, "swooshy" effect. Now usually done electronically with delay and comb-filtering, the effect was originally created by mixing the outputs of two synchronized tape decks playing the same material. By pressing a finger against the flange (top) of one tape reel, the speed of one machine was slowed slightly, creating phase shifts. FM synthesis: A method of synthesis whereby a new waveform is created by using one or more waveforms--usually within the audible frequency range--to alter (modulate) the frequency of a carrier waveform. Increasing the depth of modulation increases the timbral shifts. 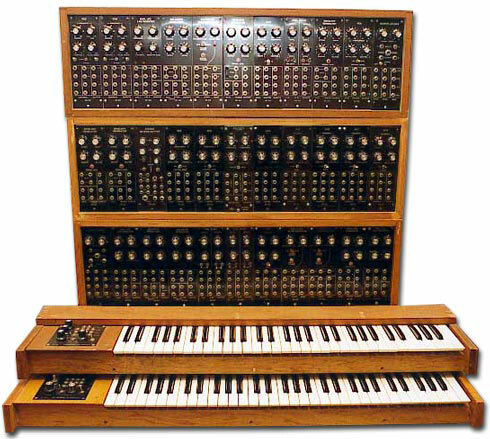 Developed by John Chowning at Stanford University's Center for Computer Research on Music and Acoustics (CCRMA) and used extensively by Yamaha in its DX-series synthesizers. See frequency modulation. Yamaha's DX7 was considered a revolutionary instrument and is still by far the best-known FM synthesizer. Fourier analysis: Mathematical technique to transform a mathematical function from one domain to another. Applied to audio signals, Fourier analysis transforms a waveform (a signal in the time domain) into a spectrum (a signal in the frequency domain) that reveals the frequency and amplitude of the component harmonics. Named for nineteenth-century French mathematician Baron Fourier. See harmonic series. 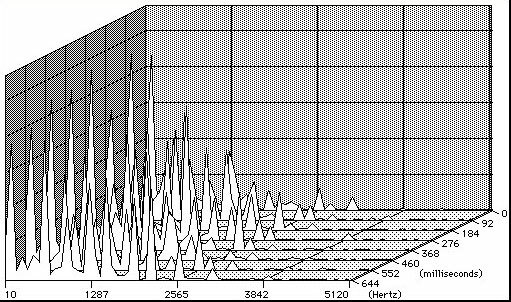 Fourier analysis shows the amplitudes of a signal's component harmonics throughout the frequency spectrum. frame rate: In film or video, the number of individual images presented per second. In 16 mm or 35 mm film, this is 24 frames per second (fps). In the USA, NTSC standard color video occurs at a rate of 107,892 frames per hour, or 29.97 fps. Video pros generally refer to this as "30 fps," which causes a lot of confusion in the audio world. frequency: The number of times a periodic waveform cycles, or repeats, over a period of time. See hertz. frequency modulation: Abbreviated as FM, this is a method of altering a waveform by changing (modulating) the frequency of the signal. The most well-known musical example of this is vibrato, which involves slight changes in frequency and level over time. In FM radio broadcasting, the signal is created by using frequency to modulate a carrier wave. See FM synthesis. FSK: Abbreviation for "Frequency Shift Keying." FSK is an audio tone, typically generated by a sequencer, drum machine, or computer MIDI interface, that is recorded on one track of an audio or video tape for synchronization to MIDI sequencers and drum machines. The tone alternates between two frequencies; the rate of the changes indicates the tempo. Now obsolete. fundamental frequency: The lowest, root frequency component of a periodic waveform. The fundamental frequency of a sound usually is perceived as its pitch. (Sometimes this is true even when the fundamental's amplitude is lower than that of its harmonics.) See harmonics. gain: A ratio expressing the difference between the input and output power, level, or current in a circuit. gate: A device that opens or closes a pathway by stopping signals that fall below a user-defined level. Audio gates often are used to salvage noisy tape tracks and silence "dirty" sound systems: The gate stays closed--blocking residual, low-level noise--until the audio signal's level exceeds a user-determined threshold; then the gate opens, allowing the sound to be heard. Gates also can be used to create effects, such as gated reverb. General MIDI: An extension to the MIDI specification that establishes a definite set of program-number and MIDI-channel assignments for a wide variety of common synth sounds. The various percussion instruments (snare, kick, etc.) are mapped to specific MIDI note numbers and assigned to channel 10. 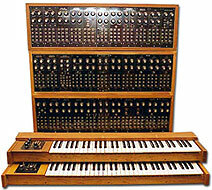 Among other requirements, GM-compatible synths must be 24-note polyphonic or better and respond to such common controllers as Velocity, Aftertouch, and Sustain. The General MIDI specification allows all GM-compatible sequence files to be played back through a GM system with predictable results. granular synthesis: A sophisticated form of additive synthesis combining sound elements ("Grains") with a specific duration (typically around 1 to 50 ms), waveform, peak amplitude, and bell-curve amplitude envelope. Hundreds or thousands of Grains are combined per second to form "Events." An Event has such attributes as start time, duration, initial waveform, waveform slope, initial center frequency, frequency slope, bandwidth, bandwidth slope, initial Grain density (number of Grains per second), slope, initial amplitude, and amplitude slope. Essentially, a sound Event is sliced into time "Screens" that contain the amplitude and frequency dimensions of hundreds of events. These Screens are assembled into "Books" that define a complete sound object. graphic equalizer: A frequency-shaping device having multiple filter bands, each operating at a fixed frequency and bandwidth. A typical graphic equalizer for professional applications, the dbx 1231 includes two channels, each with 31 bands. ground loop: A condition occurring when several ground pathways exist between two devices, resulting in hum and increased noise. harmonic series/harmonics: The set of all frequencies that are integer multiples of a periodic waveform's fundamental (lowest component) frequency. Periodic waveforms are made up of component waves, called "harmonics," which occur at frequencies that are integer multiples (1x, 2x, 3x, etc.) of the waveform's fundamental frequency. The first harmonic is the fundamental or root frequency; the second harmonic occurs at two times the fundamental frequency (an octave higher); the third harmonic at three times the fundamental; etc. The amplitudes of the harmonics vary between different waveforms; for instance, a given sound might have a lot of the third and fifth harmonics, while the second harmonic - or even the fundamental - might be absent. These differences are perceived as timbral variations. The first sixteen harmonics in the harmonic series for the fundamental C = 65.4 Hz. The quarter notes indicate the seventh, eleventh, thirteenth, and fourteenth harmonics actually occur at a frequency slightly sharp or flat of the notated pitch. headroom: The margin of safety (usually expressed in decibels) between nomimal operating levels and a signal-overload condition. Hertz: A unit of measure of the frequency of a vibrating object, such as a guitar string, speaker cone, or electrical signal. Equivalent to cycles per second, it is named for Heinrich Hertz and is abbreviated "Hz." highpass filter: A circuit designed to attenuate, or cut, frequencies that fall below some designated point while allowing higher frequencies to pass unaffected. hypercardioid: A variation of the cardioid microphone pickup pattern. A hypercardioid microphone is most sensitive at the front and sides, while rejecting sounds entering 120 degrees to the rear. The hypercardioid microphone is much less sensitive to sounds entering 120 degrees off-axis (120 degrees from the front of the mic) than to sounds from the front. This allows stage monitors to be located in an ideal location for most performing keyboardists. impedance: Measured in ohms, this is a way of expressing a circuit's opposition (resistance and reactance) to a signal or current attempting to pass through. The practical difference between impedance and resistance is that impedance changes as a function of frequency. j-card: The printed card inserted into a cassette tape box; so named because it resembles a "J" when viewed from its end. jack: A "female" connector, designed to "mate" with a "male" connector, or plug. jam sync: A family of techniques in which a synchronization device reads time code and generates new time code that may not have the same address as the source code. K: Symbol for "kilo" in computer applications, where a kilo represents 1,024, rather than 1,000. For example, one kilobyte (1 KB) equals 1,024 bytes. See byte. k: Scientific symbol for "kilo" (1,000). For example, a standard test tone is 1,000 Hz, which also can be stated as "1 kHz." L/A synthesis: Abbreviation for "Linear Arithmetic," a sound-synthesis method developed by Roland Corporation that creates new sounds by attaching the attack portion of a sampled waveform to a simpler waveform. Human sound-recognition is heavily influenced by hearing the attack part of a sound, but simple waveforms consume less storage than samples. By combining the two, L/A synthesis is capable of relatively sophisticated sounds with modest data-storage requirements. Roland's D-50 L/A synthesizer grafts sampled attacks onto simpler waveforms. layering: The process of playing or triggering two or more sounds simultaneously to create a composite sound. LFO: Abbreviation for "Low-Frequency Oscillator," a circuit that creates subsonic (below 20 Hz) waveforms that are used to modulate other circuits. Applying an LFO to an amplifier can result in tremolo effects; vibratos can be created by using an LFO to control an oscillator. Typical LFO parameters are frequency, depth, and waveform. limiter: A device that severely restricts the upper dynamic range of a signal, regulating the rate of increase of an input signal's amplitude to keep it from exceeding a predetermined threshold. Limiters are closely related to compressors but apply much higher compression ratios, usually in excess of 20:1.
line level: An input or output operating level, typically -10 dBV for home and semi-pro equipment and +4 dBm for professional gear. Typical line-level audio signals include synth outputs, mixer outputs, and signal-processor outputs. Local Control: A MIDI function that determines whether a MIDI device will respond to commands from its keyboard or other onboard ("local") controller (Local On), or only to commands appearing at its MIDI In port (Local Off). looping: Defining a particular passage in an audio or MIDI recording and making it repeat as many times as desired. In sampling, looping commonly is used to repeat the sustained section of a sound, thus creating a note that continues to play as long as a key is depressed. See MIDI loop. lowpass filter: A circuit designed to attenuate frequencies that occur above some designated point, while allowing lower frequencies to pass unaffected. LTC: Abbreviation for "Longitudinal Time Code," referring to SMPTE time code that is recorded on an audio recorder or the audio track of a video recorder. MADI: Acronym for "Multichannel Audio Digital Interface," a professional standard for transmitting up to 56 channels of digital audio data over a single cable. megabyte: A quantity of computer data or memory capacity equal to 1,024 kilobytes, or 1,048,576 (1,024 x 1,024) bytes. Abbreviated "MB." MIDI: Acronym for "Musical Instrument Digital Interface," a serial communications protocol and hardware specification for electronic-music, computer, and audio gear. The protocol consists of a set of messages that represent various aspects of a musical performance. The MIDI 1.0 Detailed Specification is available from the MIDI Manufacturers Association. MIDI channel: A system for independently addressing up to sixteen separate MIDI devices over a single MIDI cable. Voice and Mode messages sent by a MIDI control device (a computer, keyboard synth, etc.) contain an identifying 4-bit channel number from one to sixteen. MIDI-controlled devices are set to respond to data on specific channels, which allows them to play certain parts and ignore others. MIDI's 16-channel limitation has been overcome by employing multiple independent MIDI ports that each route sixteen channels, offering the possibility of dozens or hundreds of channels. MIDI Clock: A message that communicates timing information between instruments in a MIDI system. Also known as "MIDI Sync." See synchronization. MIDI Echo: A feature that routes MIDI messages appearing at a device's MIDI In port through its processor, unaltered, to the MIDI Out port. This allows you, for instance, to control a MIDI sound module simultaneously from a sequencer and a keyboard. MIDI Echo differs from MIDI Thru in that there is a direct, hard-wired connection between the MIDI In and Thru jacks, so the datastream doesn't pass through the device's processor. MIDI interface: A device that transforms MIDI signals into a form a computer can accept. M-Audio MidiSport 2x2 Anniversary Edition USB bus-powered MIDI interface. MIDI loop: A condition that occurs when data from a device's MIDI Out port is routed to that device's MIDI In port, creating doubled notes and jumbled MIDI messages. MIDI Machine Control: A protocol for using MIDI commands, usually from a sequencer, to control the transport functions (stop/play/record/locate/rewind/fast forward) of a tape recorder. MIDI mode: A setting that determines how a particular MIDI device or instrument reacts to transmitted voice data (such as playing notes polyphonically or monophonically) and channel data. There are four basic MIDI modes, each created by a different combination of the messages Omni On/Off (defining the ability to react to data on all MIDI channels) and Poly/Mono. In Mode 1 (Omni On, Poly), the receiving instrument reacts to data on all MIDI channels (hence the name "Omni") while playing notes polyphonically. Mode 2 (Omni On, Mono) is similar, but the instrument only plays monophonically (i.e., one note at a time). Mode 3, often called "Multi" mode, is Omni Off, Poly; each synth (or multitimbral part) plays polyphonically on its own MIDI channel. Mode 4, a.k.a. "Mono" mode, is Omni Off, Mono; this mode is especially useful for MIDI guitar, as it allows each string to play monophonically on its own MIDI channel. MIDI Show Control: A protocol in the MIDI Specification designed to integrate and control stage equipment, such as lighting, hydraulics, rigging, video machines, pyrotechnics, and fog machines. MIDI Thru: A port that outputs the same MIDI datastream as received at a device's MIDI In port. The two ports are hard-wired together. Especially useful for "daisy-chaining" several MIDI devices to be driven from a single source. A "MIDI Thru box" is a device that routes data from a MIDI In port to multiple MIDI Thru ports. See MIDI Echo. MIDI Time Code: Abbreviated as MTC, MIDI Time Code is a synchronization signal that allows MIDI-based equipment to follow an absolute timing reference that is independent of tempo. An additional part of the MTC spec is the Setup message, which allows you to specify a list of events that should occur at specific times. millisecond: One one-thousandth of a second. Abbreviated "ms."
MiniDisc: A digital format that uses Sony's proprietary ATRAC (Adaptive TRansform Acoustic Coding) data compression to fit up to 74 minutes of digital audio on a 64 mm recordable, erasable magneto-optical disk. Commercial prerecorded MD releases use an optical-only playback format and are not recordable. Abbreviated "MD." modular digital multitrack (MDM): An expandable digital recording system comprised of individual multitrack units (modules), where the number of available tracks can be increased simply by adding additional modules to the system. Examples of modular recording systems include the Akai A-DAM, Alesis ADAT, Tascam DA-88, and Yamaha DMR8/DRU8. The Alesis ADAT modular digital multitrack tape recorder changed the music world by bringing professional digital recording quality to the personal studio. Shown here: the ADAT LX20. modular synthesizer: A type of synthesizer in which the components (such as controllers, oscillators, filters, and amplifiers) are designed as separate devices interconnected by patch cords. The Aries Modular System 300 was a high-quality modular synthesizer designed by Dennis Collin, who also designed the venerable ARP 2600.
modulation: The process by which one element of a system (such as a synthesizer) affects another. For example, in a synthesizer, MIDI Velocity messages can be used to affect (modulate) the cutoff frequency of a filter. An envelope generator modulating an amplifier's amplitude setting causes the signal's level to change over time. modulation wheel: Also called a "mod wheel," this hand-operated continuous controller can be assigned to make real-time changes in a variety of synth and signal-processor parameters. Usually found to the left of the pitch wheel on most electronic keyboards. monaural: Having one audio channel. Mono Mode: See MIDI Mode. monophonic: Capable of playing only one note at a time. MPU-401: A peripheral developed by Roland for interfacing IBM PC-compatible computers with MIDI devices. Eventually accepted as a standard interface by many hardware and software companies. Multi Mode: See MIDI Mode. multitimbral: Describes a MIDI instrument capable of responding to multiple MIDI channels simultaneously, while assigning a different sound to each. For example, a multitimbral instrument could be capable of playing piano, bass, and drum parts simultaneously. mute: A control that interrupts ("mutes") the flow of a signal. For example, during a mixing session, a console with muting would allow the engineer to silence a noisy guitar track during a quiet introduction and activate it just before the guitar part begins. Some mixers offer the ability to automate mutes via MIDI. NAMM: Abbreviation for the National Association of Music Merchants, a trade association of musical-instrument retailers who convene one or more times each year to see new musical instruments and products displayed by hundreds of manufacturers. near-field speaker: A compact studio monitor designed for listening at close distances, typically between three and five feet. When sitting at this near-field distance, the listener hears a greater proportion of direct sound from the monitors (compared to the reflected sound bouncing around the room), so in theory, the effects of poor room acoustics are greatly reduced. normalize: In sampling or disk-based recording systems, this refers to an operation that raises the level of the highest peak to exactly 0 dB and then raises all other samples by an equal amount. non-drop frame: See drop frame. 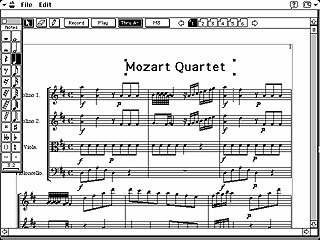 notation program: Computer software that allows the user to create and print musical scores. Sometimes called a scoring program. Sample screen from Passport's venerable Encore music-notation program. notch filter: A band-reject circuit that is capable of removing frequencies in an extremely arrow range, while all other frequencies remain unaffected, (i.e., undesired frequencies are "notched" out). See band-reject filter. Note Off: MIDI message that tells a synthesizer or other electronic sound source to stop sounding a particular musical note. See Note On. Note On: MIDI message that tells a synthesizer or other electronic sound source to begin sounding a particular musical note. See Note Off. Nyquist theorem: A basic tenet in digital audio systems, stating that the highest throughput frequency in a sampling system must be equal to or less than one-half the sampling frequency. Theoretically, the highest frequency reproducible (without generating undesirable aliasing noise) by a DAT recorder operating at a sampling rate of 48 kHz is 24 kHz. In practice, with the need for brickwall anti-aliasing filters, the actual upper frequency response of such a system is somewhat less. See aliasing. offset: A time-difference correction made between two (or more) transports to achieve proper synchronization. For example, if a VCR and multitrack audio recorder are 1.5 seconds out of sync, instructing the synchronizer to calculate an offset for that amount could resync the sound and picture. Also describes a correction that affects the onset of an event; for example, a velocity curve offset defines a threshold below which no Velocity data is sent. When the Velocity value exceeds the threshold, velocity response follows the selected curve. Ohm's Law: The basis for nearly all electronic and electrical theory, this law states a constant relationship between voltage, current, and resistance. In a circuit, the voltage across an element is equal to the current in amperes through the element, multiplied by that element's resistance in ohms. Mathematically, this is expressed as E = IR, where E is the voltage, I is the current, and R is the resistance. Omni mode: See MIDI mode. omnidirectional microphone: A microphone that is equally sensitive to sounds coming from all directions. oscillator: A device or software construct that alternates between high and low states to generate a periodic signal. panic button: A hardware or software feature that simultaneously sends All Notes Off and Reset All Controllerscommands to a MIDI system. Because some instruments don't respond to All Notes Off commands, some panic buttons are designed to also send Note Offmessages (0-127) on all channels. See All Notes Off, Reset All Controllers, Note Off. panning: The ability to place a monaural signal at any point in the stereo soundfield of a stereo signal, using amplitude clues for localization. Short for "panorama," a pan control on a mixing board is a rotary control where the extreme counter-clockwise position routes a signal to the left channel output, the extreme clockwise position routes the signal to the right, and the center position sends the signal equally to the right and left sides. parameter: One of many variable settings that combine to create a finished program in a synthesizer, signal processor, or other microprocessor-based device. Typical synthesizer parameters include type of waveform, envelope attack value, and velocity response. Typical signal-processing parameters include reverb time, decay, and delay time. parametric equalizer: A circuit designed for frequency-selective attenuation or boosting of a signal's amplitude, with independent controls for gain, center frequency, and bandwidth (including continuously adjustable Q). A quasi-parametric EQ may provide full frequency and gain adjustment, but only two or three Q settings. Sweepable EQs have an adjustable (sweepable) center frequency, but operate on a fixed bandwidth. See Q. The Ashly PQX 571 is an analog, single-channel parametric equalizer with frequency, bandwidth, and gain controls. patch: Slang for a synthesizer or signal-processor program. The term stems from the creation of modular analog synthesizer sounds by connecting ("patching") synth modules with audio cables. See modular synthesizer. patch bay: A central routing center for signals, such as audio, video, or MIDI data. While patch bays have traditionally used short cables (called patch cords) to route signals to various points on a panel of jacks, they have been evolving slowly into microprocessor-controlled devices that handle and store signal routings electronically. phantom power: A method of powering condenser microphones by sending DC current (typically 9 to 52 volts) over the same mic cable that carries the audio signal. "Phantom" is derived from the fact that there is no visible power cord and the voltage is not perceptible in the audio path. phase: The relative measurement of a period of time referenced to the start point of a cycle of a periodic waveform. In one complete period, a wave's polarity fluctuates 360 degrees (180 degrees positive and 180 degrees negative). Absolute phase is a reference point in time within one cycle, e.g., halfway through one period, the waveform's phase is 180 degrees; at one-quarter of the waveform, the phase is 90 degrees. Relative phase is an instantaneous ("snapshot") measure of the difference in time between two acoustic or electronic waveforms of the same waveform and frequency. For example, if one waveform is one-quarter of the way through its cycle (90 degrees, at its peak positive value) and the other is three-quarters of the way through its cycle (270 degrees, at its greatest negative value), they are 180 degrees out of phase with respect to each other. The two signals are "in phase" if their amplitudes are identical at the same point in their cycles. The top graph shows two identical sine waves that are in phase with each other: The waves attain their highest and lowest levels simultaneously. In the lower graph, the bottom sine wave has been delayed to put it 180 degrees out-of-phase with the upper sine wave: As one wave peaks, the other is reaching its lowest level. 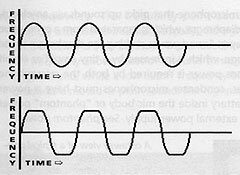 phase shift: A slight time difference between two similar waveforms, which puts them out of phase with respect to each other. phase cancellation: An attenuation of signal components resulting from combining out-of-phase waveforms. When two waveforms are mixed, their harmonics are added. If the signals are out of phase with each other, the amplitudes of the harmonic components differ at various times (as determined by the phase relationship). If the added harmonics have the same polarity, the signal is reinforced at those frequencies. If harmonics with positive values are added to harmonics with negative values, the signal is attenuated (canceled) at those frequencies. phase distortion synthesis: A form of modulation synthesis in which the spectrum of a digitally controlled amplifier's output signal is altered by modulating the DCO's clock frequency within each cycle, while the overall frequency is kept constant. The oscillator's clock frequency speeds up and slows down, producing rapid phase changes as the waveshape is alternately compressed and expanded (distorted) to fit within the regulated period. Popularized by the Casio CZ-series synthesizers. See DCO. Despite its diminutive size, the budget-priced Casio CZ-101's phase-distortion synthesis sounds made it a popular choice in many studios and bands. phase shifter: Also called a "phaser," this signal processor is derived by splitting an input into two components, one of which remains unaffected while the other is altered by a series of all-pass filters, which provide a frequency-dependent time delay. This time delay is constantly modulated. When the two components are combined, the ever-changing amounts of frequency cancellation and reinforcement create a swirling effect known as phasing. 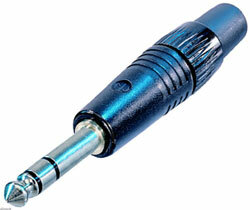 phone connector: A connector based on a plug having a shaft 1/4 inch in diameter. Commonly used as audio connectors on electric guitars, synthesizers, and "semi-pro" signal processors and mixers. Originally developed by Bell Telephone (hence the "phone" name). A typical 1/4-inch phone plug. phono connector: Sometimes referred to as an RCA connector, these are generically known as pin-jack connectors. Commonly used on home stereo equipment, the "phono" designation for these audio connectors comes from the fact that they are almost universally used for the outputs on phonographs. The phono connector, often called an RCA connector, is commonly found on consumer audio gear. pink noise: A test signal comprised of random noise that has been shaped to provide equal intensities of sound in each octave band. Pink noise is used for test signals because its spectral balance closely compensates for the frequency sensitivity of the human ear. pitch bend: A method of sound manipulation that sweeps a sound's frequency up or down. polar pattern: A circular, two-dimensional plot that indicates the directional response of a transducer. While polar patterns are commonly used to show microphone pickup patterns, they also can indicate the dispersion of a speaker. Interpreting polar patterns, even with something as simple as a common cardioid microphone, can be fairly complex. For one, the polar response shown on paper doesn't indicate the fact that a microphone's pickup pattern is actually a three-dimensional space around the mic. Secondly, the polar response of any microphone is frequency-dependent. For example, an ultra-directional "shotgun" microphone is extremely directional at high frequencies and much less so at low frequencies. The pickup pattern of this Sennheiser MD-421 cardioid microphone illustrates that polar response is a 3-dimensional phenomenon. Poly mode: See MIDI mode. polyphonic: In electronic musical instruments, refers to the ability to play several notes simultaneously. portamento: Also known as "glide," or "glissando," this is a technique for achieving a smooth, continuous pitch change between two notes, as with a trombone's slide. post-fader send: Sometimes called an "effects send," this refers to a console auxiliary send that is connected after ("post") a channel's output fader. For example, if a post-fader send is used to route part of a vocal track to a reverb, when the vocal channel's level is raised with the fader, the amount sent to the reverb also would increase. See pre-fader send. potentiometer: An electronic component consisting of two terminals connected to either end of a resistive element and a conductor that can be moved between the two ends, thus allowing the creation of a variable resistor or voltage divider. Potentiometers are most often rotary controls (such as volume controls), but also exist as linear controls, such as faders or sliders. Often called a "pot." ppqn: Abbreviation for pulses (or parts) per quarter note, a means of expressing the timing resolution or accuracy of a MIDI sequencing or synchronizing device. MIDI clocks are generated at a rate of 24 ppqn, although many sequencers feature timing resolutions of 480 ppqn or more. pre-fader send: Sometimes called a "monitor" (or "foldback") send, this refers to a console auxiliary send that is connected before ("pre") a channel's output fader. For example, if a pre-fader send is used to route part of a vocal track to a stage monitor, when the main vocal channel's level is raised, the amount sent to the monitor would be unchanged. See post-fader send. program: A preset or combination of settings on a synthesizer, signal processor, or other microprocessor-based device. Also refers to a computer application. Also, the process of creating a preset or combination of settings. Program Change: A MIDI command that instructs a MIDI device to change to a new setting, which can be any of 128 different program numbers. project studio: A private-use studio, designed and equipped expressly for producing the owner's projects. While a project studio may be located in a home, it should be capable of producing professional-quality results, as compared to a "hobby" studio. proximity effect: A boost in the low-frequency response of a directional microphone that occurs when the sound source is relatively close to the microphone. The phenomenon begins when the source is about two feet away from the mic capsule and becomes more noticeable as the subject gets closer to the mic. Used properly, a singer can use the proximity effect as a means of adding fullness to a voice; however, the effect can also emphasize low-frequency noises such as breath sounds and popping consonants ("p" and "b" sounds). psychoacoustics: The study of how sounds affect the human brain. Over the years, psychoacoustic research has resulted in an improved understanding of human hearing, such as the way the brain processes sounds picked up by the left and right ears and translates subtle differences between the two into cues that indicate directionality. pulse-code modulation: a common method used in encoding, transmitting, and/or storing digital data. The name stems from the technique of creating a string of pulses to represent an input signal; the pulse chain is coded to increase the efficiency of storing the data. Abbreviated "PCM." pulse wave: A variable rectangular waveform that alternates almost instantaneously (i.e., with a slope of approximately 90 degrees) between steady high (+) and low (-) states. Its harmonic spectrum is a function of its duty cycle; for example, in a pulse wave with a duty cycle of 1/3 (one on, two off), the amplitude of every third harmonic is zero; hence, it contains the fundamental, second harmonic, fourth, fifth, seventh, eighth, etc. A square wave is a pulse wave with a 1/2 (50%) duty cycle (i.e., it alternates between equal-length high and low states); therefore, the value of every second (even-numbered) harmonic is zero. A pulse wave with a duty cycle greater than 1/2 has the same spectrum as a pulse wave whose duty cycle has the same denominator (e.g., a 2/3 duty cycle gives the same spectrum as a 1/3 duty cycle). See duty cycle, pulse-width modulation. A typical square wave, which is a type of pulse wave. pulse-width modulation: An analog synthesis technique in which a low-frequency oscillator or other modulation source is applied to vary the length of time a pulse wave remains in its high state (i.e., its width). This varies the amplitudes of the fundamental and lower harmonics, with an effect similar to sweeping a lowpass filter. Abbreviated "PWM." See pulse wave, pulse-code modulation. punch in/punch out: A feature that allows a user to enter (punch-in) and/or exit (punch-out) the recording function while a MIDI sequencer or audio recorder is playing. "Punching" often is used to replace certain sections of an otherwise usable recorded part without having to redo an entire track. Q: In filters, the ratio of a bandpass or band-reject filter's center frequency to its bandwidth. Thus, assuming a constant center frequency, Q is inversely proportional to bandwidth (i.e., higher Q values indicate a narrower bandwidth). For this reason, the term often is use to denote bandwidth. See parametric equalizer, resonance. quantization: In digital audio, the division of a continuous event (such as an analog signal) into a series of discrete steps, which is inherent in current technology. In MIDI sequencing, quantization is an operation that moves notes recorded into a sequencer to (or within a definable distance of) the nearest beat or other note marker, such as an eighth or sixteenth note. Quantization allows a less-than-perfect performance (from a timing standpoint) to be corrected to perfect tempo. Over-quantization results when such correction is so extreme that the sequence becomes stiff or robotic. On some devices, the quantizing feature is referred to as "auto-correct." rack-mount: Equipment designed to fit industry-standard, 19-inch-wide equipment racks and cases. The height of rack-mount gear is standardized in 1.75-inch "units": a 2U (2-unit) device is 3.5 inches tall, a 3U chassis is 5.25 inches tall, etc. RAM: Abbreviation for "Random Access Memory," an integrated circuit (IC) chip capable of storing and retrieving computer data for microprocessor-based devices. Data stored in RAM can be overwritten (replaced) by new data, and any of the information can be accessed as required by the host device's CPU. RCA connector: See phono connector. R-DAT: Another way of referring to a DAT cassette, which stems from the early days of DAT development, when two formats--rotary head (R-DAT) and stationary head (S-DAT)--were proposed. Eventually, all manufacturers agreed on the R-DAT format, which is used today. As S-DAT recorders never went into production, using the "R" designation when describing a DAT tape is unnecessary. See DAT. real time: A means of recording or manipulating audio or data as it occurs. For example, a tape copy of a phonograph record must be recorded in real time. In electronic music, notes are often played into a sequencer in a "live" performance (recorded in real time), rather than entered one note at a time, i.e., in step time. Real-Time Message: See System Real-Time. release: The final stage of an envelope, where the signal falls from the sustain level to zero. In the case of electronic keyboard instruments, the release stage of a waveform typically begins as soon as the key is lifted. See ADSR. Reset All Controllers: A MIDI message that returns all MIDI controller values (e.g., Modulation, Pitch Bend, Aftertouch, etc.) to zero. resistor: An electronic component that opposes the flow of electrical current. Resistance is measured in ohms (the symbol for which is the Greek letter omega). resolution: A way of expressing the accuracy with which a device records or reproduces a quantized event. In digital audio applications, resolution refers to the number of bits--i.e., 16-bit, 20-bit, etc.--used to represent a sample. With all else equal, a system with a higher sample resolution will provide more accurate recording and reproduction. In MIDI sequencing, the recording resolution (expressed in pulses per quarter note, or ppqn) measures the accuracy with which a device or program is capable of recording or reproducing MIDI data. See ppqn, quantization. resonance: In physics, the property possessed by a simple vibrating body of oscillating more strongly in sympathy with a regular oscillatory disturbance at the same frequency. When a vibrating object (such as a guitar body) is stimulated by a second oscillator (such as a vibrating string), its pattern of vibration may be altered. If the two vibrate at the same (or a harmonically related) frequency, they tend to phase-lock together in sympathetic vibration at this common resonant frequency. The amplitude of their vibration is thus greatly increased. Oscillations at non-harmonic frequencies have far less effect. The same principle holds with electrical signals. 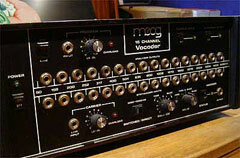 Analog synthesizers often include voltage-controlled filters (VCFs) with resonance controls. Increasing the resonance of such circuits emphasizes the filter's cutoff or center frequency. If the amount of resonance of a filter is raised high enough, the filter begins oscillating at the cutoff frequency, thus generating its own waveform. reverberation: The decaying residual signal that remains after a sound occurs, created by multiple reflections as the original sound wave bounces off walls, furniture, and other barriers within a room or other acoustical environment. Modern reverb effects processors use digital signal processing (DSP) techniques to simulate acoustical spaces. Analog methods of simulating reverberation include spring reverbs (commonly used in guitar amps), plate reverbs (which use a mechanical transducer to vibrate a large metal plate), and reverb chambers (where signals from a speaker sounding in a room are picked up by one or more microphones). ribbon microphone: A type of dynamic microphone that uses a thin metal ribbon placed between the poles of a magnet. Most ribbon mics are bidirectional, meaning they pick up sounds equally well from either side of the mic. See dynamic microphone. Like many ribbon microphones, The Royer R-121 provides a figure-8 pattern, sensitivity in the dynamic mic range, and a warm, realistic tone and flat frequency response. However, the R-121 has higher output and is much less fragile than the older ribbon mics. RMS: Abbreviation for Root-Mean-Square, a formula for describing the level of a signal. RMS is derived by squaring all the instantaneous voltages along a waveform, averaging the squared values, and taking the square root of that number. When used to describe power amplifiers, RMS power (in watts) is considered a more useful measure of power output than "program" or "peak" power. (A power amp's performance depends on the nature of the input signal. "Peak" power ratings don't account for this, whereas RMS ratings, because they are derived from multiple points in a sine wave, more closely reflect the actual energy content of the input signal.) RMS also is used to measure input sensitivity (in volts) in a preamp or line amplifier. ring modulator: A circuit that multiplies the voltages of two input signals, yielding the sum and the difference frequencies--but not the original signals--as its output. A true ring modulator is a 4-quadrant amplitude modulator, so either signal can have a positive or negative value. The amplitude of the sideband frequencies depends on the depth of modulation. Although there is not a harmonic relationship between the sideband frequencies, there is a mathematical relationship, so the result is a ringing, metallic sound, not noise. 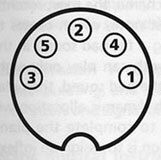 The original circuit was based on a ring of four diodes, with input and output connections made at the nodal points of the ring. See diode. roll-off filter: A circuit that attenuates a signal that is above (lowpassfilter) or below (highpass filter) a specified frequency. For example, microphones frequently have a bass roll-off filter to remove wind noise and/or excessive breath pops. ROM: Acronym for Read Only Memory, a non-erasable chip or circuit capable of storing computer data. See RAM. sample: A digitally recorded sound. The term "sample" is sometimes used specifically to denote the smallest possible division of such a sound. When a sound is digitally recorded, the continuously changing voltage that represents a waveform as an analog signal is converted into a series of numbers. Each sample is a numerical (digital) "snapshot" of that analog waveform at a specific point in time. Sample Dump Standard: An extension of the MIDI Specification that defines a data format for storing and exchanging digital sample data between devices. sampler: A device with the capability to digitally record and play back sounds from a keyboard or in response to MIDI messages. Samplers typically offer the ability to store sounds on disk, and often provide extensive sound manipulation capabilities, such as pitch changing, editing, looping, and layering. Sample players are devices with similar functions but lacking record capabilities. E-mu's Emulator III sampler is considered a classic instrument. sample & hold: A circuit that looks at (samples) an incoming waveform at a particular point in time, measures its voltage at that instant, and holds (continues outputting) an identical voltage until the next sample is taken. The process may occur at regular intervals (controlled by an internal clock) or may be externally triggered. A typical application in analog synthesis uses the voltage output of a sample & hold circuit to manipulate a VCO (voltage-controlled oscillator). sampling frequency: See sampling rate. sampling rate: Also referred to as "sampling frequency," this is the rate at which "snapshots" of an analog signal are converted into digital representations. The higher the sampling rate, the greater the accuracy of a digital reproduction. See Nyquist theorem. sawtooth wave: Also known as a "ramp wave," this is a periodic waveform having a smooth, linear rise from its lowest to its highest amplitude and then dropping instantaneously to its lowest point again. Sawtooth waves contain the fundamental frequency and all other harmonics, and exist in either positive-ramp (sawtooth up) or negative-ramp (sawtooth down) forms. A typical ascending sawtooth wave. SCMS: Acronym for Serial Copy Management System, this is an audio copy-protection scheme that inserts a copy-protect flag (message) when a digital-to-digital copy of a recording is made. Once the flag is in the subcode of a tape, no subsequent copies can be made from that tape. Designed into most home digital recorders, SCMS is frequently a problem when transferring material from a consumer-type deck into a digital workstation, or when attempting to make safety copies of important sessions. One sure-fire means of avoiding SCMS problems is to record and/or transfer material using professional digital gear equipped with AES/EBU digital interfaces, which are unaffected by the SCMS flags. SCSI: Acronym for Small Computer Systems Interface, a standard parallel interface for connecting peripheral devices such as hard disks, optical drives, CD-ROMs, etc., to a computer. semitone: A musical value equal to a half-step. In equal temperament, there are twelve semitones in each octave. sequencer: A hardware- or software-based device that allows the storage of MIDI performance information (e.g., Note On, Note Off, and Velocity messages). signal-to-noise ratio: A ratio (in decibels) that expresses the difference between the level of a signal at a reference point in a circuit and the level of electrical noise at the same point. sine wave: A continuous, periodic waveform whose amplitudevaries as the sine of the linear function of time. Occasionally referred to as a sinusoidal wave, it has no harmonics except the fundamental. slave: A device that is designated to respond to commands from another device in the system. For example, with the appropriate peripherals, a MIDI sequencer can act as a slave to a video recorder, where the MIDI tracks would follow (chase-lock to) a synchronization signal recorded on the VCR's audio track, thus allowing scoring-to-picture. SMPTE time code: Adopted by the Society of Motion Picture & Television Engineers in 1972, SMPTE time code is a means of representing the exact time locations of video frames using a fairly simple digital code. Readily recorded on the audio track of any audio or video recorder, the code is expressed in hours, minutes, seconds, frames, and (occasionally) subframes. Presently, there are several versions of SMPTE time code: in the USA, each second of NTSC color video is divided into 29.97 frames; the European frame rate is 25 fps (frames per second); and for motion picture work, 24 fps is standard. In addition, MIDI sequencers often sync to 30 fps SMPTE time code. When recorded on the longitudinal audio track on a standard VTR, SMPTE time code is referred to as Longitudinal Time Code (LTC). Some high-end pro VTRs have the ability to store SMPTE time code signals in the vertical blanking interval between frames so no audio track is "wasted" recording time code; this method is known as Vertical Interval Time Code (VITC). See drop-frame. solo: A feature on a mixing console that automatically routes one or more selected channels to the recording monitors or headphones without disturbing the main audio mix. For example, if a buzzing sound is heard while recording a drum/piano/bass rhythm section in the studio, an engineer can push the solo button on several tracks to locate the offending instrument. Some studio consoles use destructive solo, where the soloed instruments replace the mix in the main stereo bus. On sound reinforcement mixing consoles, solo functions are normally routed to headphones (non-destructive solo), allowing the engineer to check console channels while the concert is in progress. In-place solo is a function that permits the user to hear individual channels, but also in the correct stereo perspective as defined by that channel's pan control. Song Position Pointer: A System Common MIDI message used to indicate a particular location in a MIDI sequence file. By reading a sync signal (such as FSK or SMPTE time code) recorded on a tape track, and converting it to a SPP message, a synchronizer could instruct a MIDI sequencer to start playing a sequence at a given location and keep it in sync with the tape. spaced pair: A stereo microphone technique where two microphones are pointed directly at the source, separated by two feet or more. Depending on the mic-to-source distance, this method can provide an extremely wide (occasionally exaggerated) stereo perspective. See X-Y miking. S/PDIF: Acronym for Sony/Philips Digital Interface, a "consumer" digital interface using either fiber-optic or coaxial (RCA) connections that allow the transfer of digital audio data from one device to another. SPL: Abbreviation for "sound pressure level," a means of expressing sound levels. Frequently used as a comparative measure of speaker efficiency or maximum system output. square wave: See pulse wave. Standard MIDI File: A standard file format for MIDI sequence data. The Standard MIDI File format allows musicians with different computers or different types of sequencers to share sequences. Abbreviated "SMF." step time: A method of recording messages into a sequencer one step or note at a time, using predefined durations, without reference to a metronome or other timing clock. See real time. striping: The process of recording a signal to a tape track, going from the beginning to end of the tape. Usually refers to recording a synchronization signal (such as SMPTE time code or FSK) onto an audio or video tape. If the time code is recorded before any other signals go on the tape, the procedure is known as "prestriping." subtractive synthesis: A sound synthesis method that creates a new sound by routing a waveform through a filter that removes (subtracts) certain harmonics from the signal. While early subtractive synthesizers used simple waves, modern instruments also can use complex, sampled waveforms. Super-Bit Mapping: A method of encoding 20-bit digital audio information for playback on standard (16-bit) compact discs. 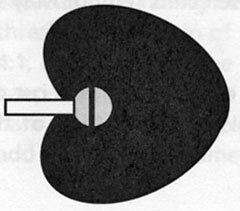 supercardioid microphone: A variation of the cardioid microphone that is most sensitive at the front, while rejecting sounds entering 150 degrees to the rear. sustain: The third component of an ADSRenvelope, in which a waveform continues at a constant level, before the release stage where the level drops to zero. In electronic music applications, the sustain stage continues as long as the note on a keyboard is held down. See ADSR. sweep EQ: See parametric equalizer. synchronization: The process of getting two or more sources to play together in reference to a common timing signal. synthesizer: A musical instrument that can generate audio waveforms electronically and provides the ability to modulate them to create new audio waveforms. SysEx: Short for System Exclusive. See System Exclusive. System Common: A type of MIDI message that includes Song Position Pointer, Song Select, Tune Request (a message requesting an analog synthesizer to tune its oscillators), and EOX (end of exclusive). See EOX, Song Position Pointer. System Exclusive: A set of MIDI messages assigned solely to a specific manufacturer, for the purpose of transmitting data that is particular to one or a family of MIDI devices. Also called SysEx messages, System Exclusive messages primarily are used to send patch parameters. Any manufacturer wishing to implement SysEx into its MIDI equipment must be granted a company-specific ID number by the MIDI Manufacturers Association. System Real-Time: A set of MIDI messages that serve as uniform timing information for the synchronization of MIDI equipment. Sometimes referred to as Real-Time Messages. THD: Abbreviation for "Total Harmonic Distortion," a condition where a circuit adds additional unwanted harmonics (e.g., second and third harmonics) that were not part of the original signal. Total Harmonic Distortion represents the effect of all the harmonic components (hence the "total" part of the name, as opposed to second- or fifth-harmonic distortion) and is usually expressed as a percentage of the signal. Theremin: One of the first truly electronic musical instruments, based on regenerative radio-receiver technology: Two radio-frequency oscillating circuits are tuned to each other (zero beats); one is fixed in frequency, and the other is detuned by hand capacitance near a vertical antenna, causing a rising whistle. By waving a hand near this antenna, the performer controls the pitch. Waving the other hand near a horizontal antenna controls the volume. Created by Soviet inventor Dr. Leon Theremin, and developed and introduced in the U.S. by RCA in 1927, the Theremin has a characteristic spooky, wailing sound. Dr. Robert Moog has manufactured Theremins since the 1950s; in 1991, he introduced a version of the instrument with modern electronics. 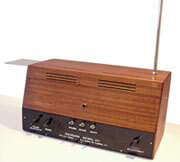 A vintage Moog Model 201 theremin. Thru box: See MIDI Thru. timbre: The tonal color of a sound, which reflects its harmonic content and envelope. Timbral content is the primary means by which sounds are distinguished from each other. track: Essentially a place to store information. A multitrack tape recorder typically provides four, eight, sixteen, or 24 tracks for recording individual parts. While a MIDI sequencer often contains data sent on one specific MIDI channel, MIDI tracks and channels are not synonymous. A single sequencer track may contain information on many MIDI channels; conversely, several MIDI tracks could be set to a single MIDI channel. See MIDI channel, sequencer. transducer: A device that transforms energy from one form to another. Examples of electromechanical transducers include microphones (which convert acoustic pressure into electrical voltage) and loudspeakers (which convert voltages into acoustic pressure). triangle wave: A periodic waveform with a linear increase or decrease in amplitude, followed by a linear change in amplitude at the same rate but in the opposite direction. As indicated by its name, this wave has a triangular shape when plotted over time. Less "pure" than sine waves, triangle waves exhibit a strong fundamental with weak, odd-numbered harmonics. Tip/Ring/Sleeve, or TRS, 1/4-inch phone plugs are often used for stereo headphones, channel sends/returns, and balanced-line connections. truncation: The act of shortening a sound by trimming extraneous portions. For example, when making a digital sample of a single snare drum beat, one invariably captures a bit of "dead" time before the note occurs, and some time after the sound decays. Truncation would thus involve deleting the dead time at the beginning of the sample (so the drum will sound as soon as a keyboard note is pressed) and doing the same at the tail of the sound. TT connector: Abbreviation for "Tiny Telephone," TT connectors use miniature phone plugs with a 0.173-inch-diameter shaft. Due to their compactness and reliability, TTs often are used for professional console and outboard patch bays in studios and live sound applications, where a single patch bay may require hundreds of patch points in a limited space. The TRS versions of TT connectors are capable of handling balanced-line signals and are preferred in pro audio installations. See phone connector, patch bay, balanced line. A typical TT connector. Nearly all TT connectors used in professional audio are 3-conductor, balanced-line types. tweeter: A loudspeaker designed to produce high frequencies. U: Abbreviation for rack "units"; see rack-mount. VCA: Abbreviation for Voltage-Controlled Amplifier, an amplifier circuit whose output gain can be varied by an external voltage. VCF: Abbreviation for Voltage-Controlled Filter, a filter circuit whose cutoff frequency can be varied by an external voltage. VCO: Abbreviation for Voltage-Controlled Oscillator, an oscillator circuit whose output frequency can be controlled by an external voltage. VSO: Abbreviation for Variable-Speed Oscillator, a circuit that is used to control the speed of a tape-recorder motor. velocity: The speed with which a key is depressed. Velocity is also a term for the specific MIDI message that communicates this information and determines how loudly or softly a sound is played. velocity-sensitive: Refers to keyboards or other MIDI controllers that can respond to a player's touch and transmit the corresponding Velocity information. Also, a device or program that responds to Velocity messages. See velocity. VITC: Acronym for Vertical Interval Time Code, a means of recording SMPTE time code into the vertical blanking interval on a high-end professional video recorder, thus offering the advantage of being readable even when the tape is not moving. As the VITC signal is recorded by the rotary heads, it must be recorded at the same time as the video signal, whereas time code signals recorded on a VTR's linear audio tracks can be striped either before or after the video picture is recorded. See SMPTE time code. vocoder: Acronym for "Voice Operated reCOrDER," a signal processor (considered one of a family of analysis synthesizers) that imposes the amplitude envelopes of one input (control) signal upon a second input (program) signal. In the most common application, someone speaks into a microphone to provide a control signal; the amplitude characteristics of the speech elements are superimposed on an input instrument, giving the latter a "talking" quality. Vocoders use a bank of bandpass filters to dynamically analyze the frequency spectrum of the control signal and thus continuously derive the amplitudes of the component frequency bands. The resulting amplitude envelopes are used to continuously control the operation of another, identically tuned bank of filters. Any program signal applied to the input of this second bank will be shaped by the amplitude envelopes of the control signal. The vocoder was developed in 1948 by Bell Telephone research physicist Homer Dudley. 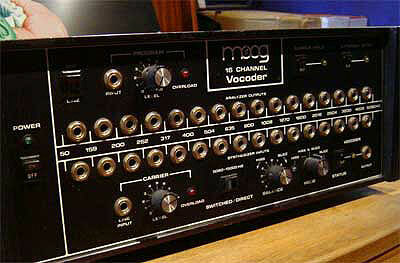 This 1979 Moog vocoder was allegedly used by Monty Python on their Contractual Obligation album. volt: A unit of measure of electromotive force (resulting from a difference in electrical potential) equal to the force required to produce a current of one ampere through an element having a resistance of one ohm. watt: Unit of measure of electrical power dissipation, formally defined as one joule (a unit of energy) per second, which is equal to the power absorbed by one ohm of resistance when one ampere of current is in the circuit. Electrical power, measured in watts, can derived in three ways: the voltage squared divided by the resistance (V2/R), the current squared times the resistance (I2R), and the product of the voltage and the current (VI). Named for James Watt, inventor of the steam engine and the speed governor. waveform: A 2-dimensional graph of one period of a signal, showing changes in pressure (amplitude) as a function of time. wavelength: The distance from the beginning to the end of one cycle (or from equivalent points in two consecutive cycles) of a waveform. Equal to the speed of sound times the frequency of the waveform. wavetable synthesis: A method of generating complex waveforms through lookup tables. Single-cycle digitized waveforms are organized in a bank or table. By scanning through these waveforms, a longer, dynamic waveform is produced. In many wavetable synths, the resulting complex waveform is used in subtractive synthesis. The Korg Wavestation A/D module creates wave sequences, a type of wavetable synthesis. white noise: A test signal comprised of random noise, providing constant energy at all frequencies, similar to the sound heard when an FM radio is set between stations. woofer: A speaker designed to reproduce low frequencies. workstation: A "keyboard workstation" is a keyboard instrument that offers multitimbral sound-playback capability, sequencing, and effects processing, thus allowing the creation of sophisticated productions entirely on one instrument. In audio applications, a workstation usually refers to a disk-based system for the recording, editing, and manipulation of audio in the digital domain. XLR: Developed by ITT/Cannon, XLRs are rugged, locking, multi-pin connectors frequently used in professional audio equipment. While 3-pin XLRs are most commonly seen on microphones and console inputs, other configurations also exist, such as 4-pin XLRs (a standard for stage intercom systems) and 5-pin XLRs (often used on stereo microphones). 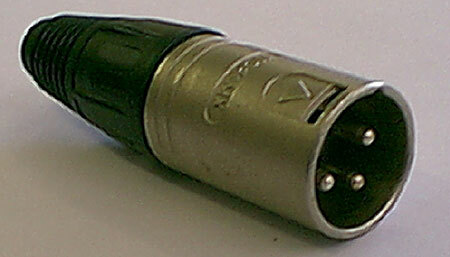 A typical XLR-3M connector; the "3" refers to the number of pins and the "M" indicates a male connector. X-Y miking: A stereo microphone technique where two directional mics (typically cardioid) cross at an angle from 90 degrees to 130 degrees, with their capsules placed closely together. In most cases, X-Y miking provides good stereo separation with a well-balanced image. See spaced pair. XYZ controller: A 3-axis touch pad that transmits voltages based on finger position along the horizontal and vertical axes (X and Y) and aftertouch-type pressure (Z). ZIF socket: Acronym for Zero Insertion Force socket, a locking mount for integrated circuits that allows integrated circuits to be changed easily with little chance of damaging a chip's fragile pins. To upgrade or change an IC, a new chip is loosely placed into the ZIF socket (hence "zero insertion force"), and a small lever tightens the socket's connection onto the pins. A 40-pin ZIF socket in a wide chip format for ROM/PROM/EPROM and 8-bit CPU chips. zone: A selected section of a MIDI keyboard, defined by a lowest and highest key. Keyboard zones usually are assigned to a common MIDI channel or channels, so that all keys played within the zone send their note and controller information to the same destination. Where two keyboard zones adjoin but do not overlap, the division between them is called the split point. Where zones overlap, they are called layers. Steve Oppenheimer has been playing music since he was four years old and has performed in a broad variety of styles, including blues, R&B, country, folk, jazz, rock 'n' roll, and acid rock. Steve studied piano, composition, electronic music, and audio engineering at the Berklee College of Music and spent over a dozen years as a full-time professional keyboardist, singer, composer, arranger, and band leader. In addition to his years as a session player and touring musician for nationally known acts, he also worked as a sound-reinforcement mixer. For the last five years, Steve O. has maintained an extensive home MIDI studio, continued to perform in concert, and served on the editorial staff of Electronic Musician magazine, where he currently is the products editor. Raised in San Francisco, George Petersen was originally trained in violin. He later became interested in drums and guitar after his family moved to Italy, where he spent his formative years. George played with both American and Italian bands, doing mostly club work, but occasionally appearing in concert, opening for acts such as The Searchers. Returning to America for college, George worked in sound reinforcement, electronics repair, audio systems design, and film/video production. While working on a Master's Degree in film, he began writing for various publications, eventually accepting an editorial position with Mix, the world's leading publication for audio professionals. Respected throughout the industry for his knowledge of recording technology, George has written over 200 articles on every aspect of audio and music production. George currently is the products editor of Mix and operates a recording studio, small record label, and music-publishing company in the San Francisco Bay Area. Special thanks to Larry the O and the staffs of Mix magazine, Electronic Musician magazine, and the Mix Bookshelf. 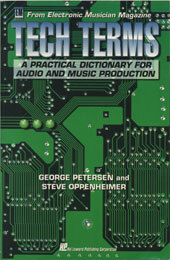 Tech Terms was originally published in 1993 by ACT III Publishing (Library of Congress Catalog Card Number: 92-075168). All rights are now owned by Steve Oppenheimer. No portion of this work may be reproduced, copied, transmitted, or stored in any mechanical or electronic form without the written permission of the copyright owner.